The three 80s movies that made G the coolest letter of the alphabet are getting a month-long art show in Southern California, and you can even order prints of your favorite pieces. When it comes to definitive movies from my childhood, The Goonies, Ghostbusters, and Gremlins certainly top the list. They were bizarre and funny and just a little scary, and I still watch them as an adult. Apparently this isn't unusual for anyone who grew up in the 80s, since the three films are getting an entire tribute art show to themselves, comprising some pretty stunning pieces by some exceptionally talented artists. The appropriately-named 1988 Gallery of Los Angeles is hosting the show, which is all about "art imitating art." According to the gallery's blog, "we partnered with Philadelphia artist collective The Autumn Society, and each artist in the show had to do one piece each, inspired by the movies Ghostbusters, Gremlins and Goonies (respectively - and respectfully). Basically, it's insane." The opening reception is already over (which is a shame, because Ernie Hudson from Ghostbusters made an appearance), but anyone who wants to check out the works will be able to do so in person until September 22nd, when the exhibition ends. However, if SoCal is further than a stone's throw for you, you can still check out the different art online and even order prints (provided they're not sold out already). 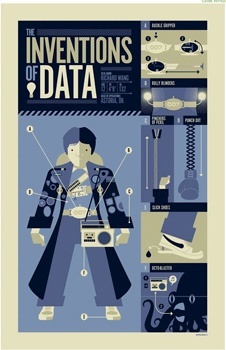 I would gladly have coughed up $55 for a copy of "The Inventions of Data" by Tom Whalen, but it's already out of stock.